Building the Bakerloo Line Extension will hopefully finish around 2028/29. So I’m publishing these maps of the areas, that could be affected by works, so if perhaps you’re thinking of moving house, you can take an appropriate decision. This is TfL’s latest route map between Elephant and Castle and Lewisham stations. 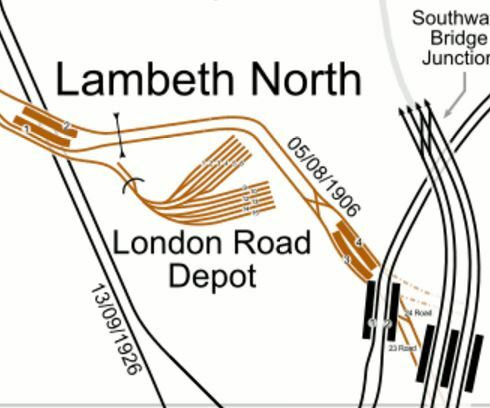 Note the two completely new stations with the imaginative names of Old Kent Road 1 and Old Kent Road 2. The full document is here on the Transport for London web site. The sites are given in route order from the North. The map from carto.metro.free.fr shows the lines through the station. The North-South lines across the map are from West to East. The Bank Branch of the Northern Line. Thameslink to Blackfriars and Orpington, Rainham, Sevenoaks, Sutton and Wimbledon. Just below this map is Kennington station, where the two branches of the Northern Line meet and will divide to Morden and Battersea Power Station stations. Elephant and Castle is effectively two separate stations at present, with one for the Bakerloo Line and one for the Northern Line. Both stations have lifts and narrow, dingy platforms and passageways. Connections between the two stations underground is not good. Works envisaged at Elephant and Castle station include. Three escalators and more lifts for the Northern Line to provide step-free access. Better connections between the two lines. I would hope that a comprehensive design would include a step-free link to the Thameslink station. I suspect, that the two stations could be rebuilt as two separate projects, with the Northern Line station being updated before the Bakerloo Line station. 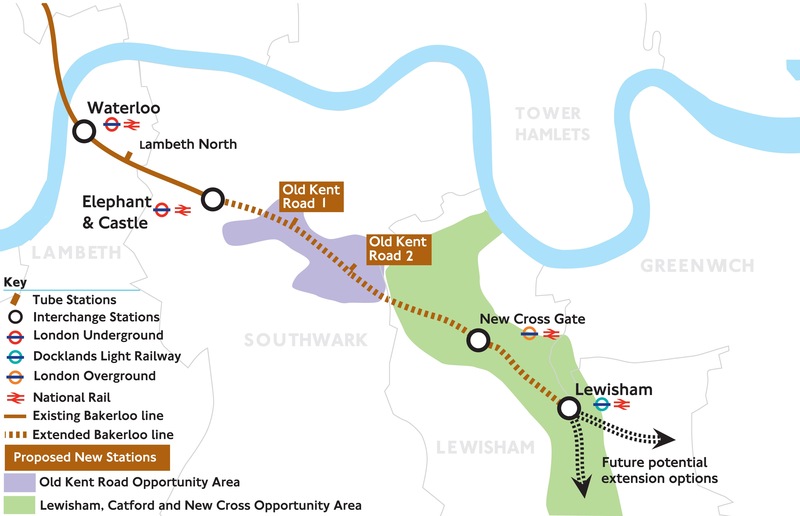 If the two projects were properly planned, I believe that trains could continue to run on the Northern Line throughout the works, with trains running to the Bakerloo Line platforms until they needed to be closed for updating and connection to the new tunnels. I wouldn’t be surprised to see an updated pedestrian connection between the Bakerloo and Northern Line platforms created first, so that at least one entrance to the platforms is available throughout the works. 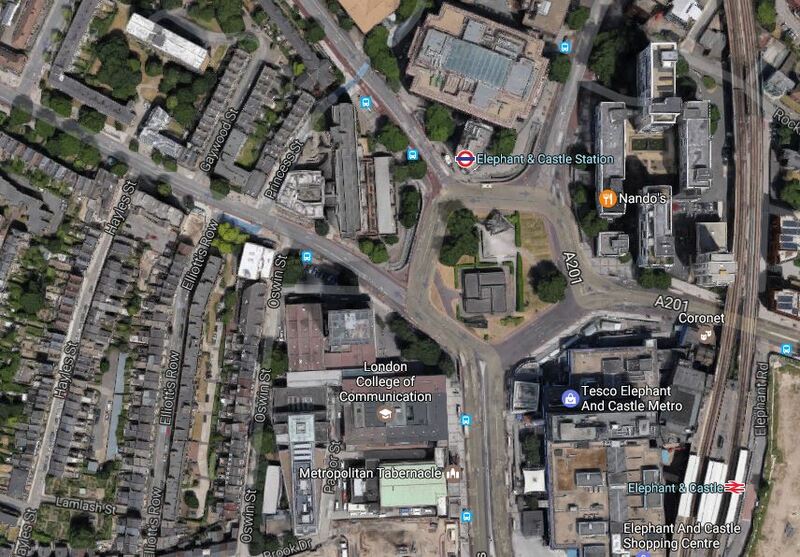 This Google Map shows the area around Elephant and Castle. Transport for London have said they need a worksite in the area. Bricklayers Arms is known to many as a roundabout and flyover on the A2 into London. 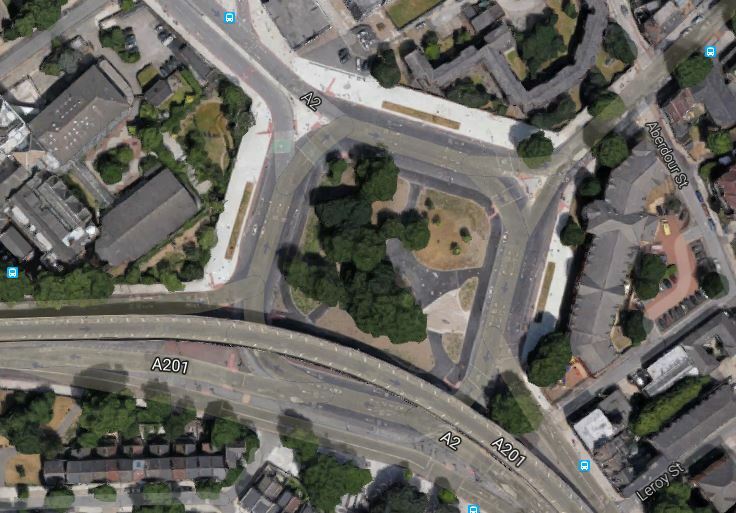 This Google Map shows the roundabout. It is one of two possible locations for a shaft that will be needed between Elephant and Castle and Old Kent Road 1 stations. These pictures of Bricklayers Arms were taken on February 12th, 2017. The worksite could be in the middle of the roundabout. 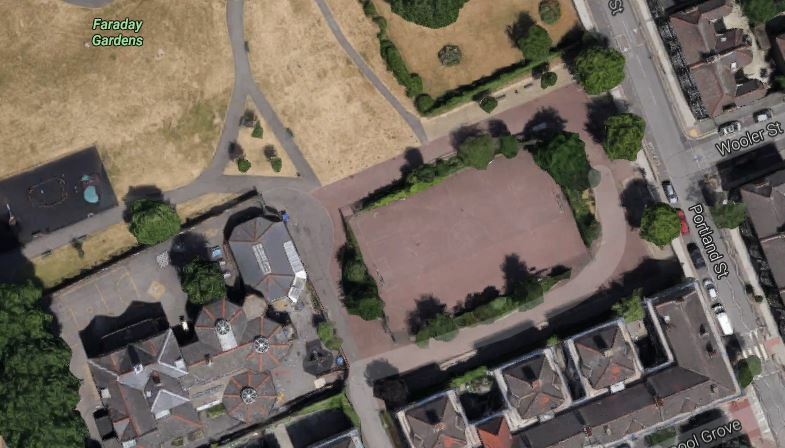 This Google Map shows the South-East corner of Faraday Gardens. The worksite could be in the a hard playground. My personal view is that the Bricklayers Arms site is the better from a working point of view, but is it in the best position? 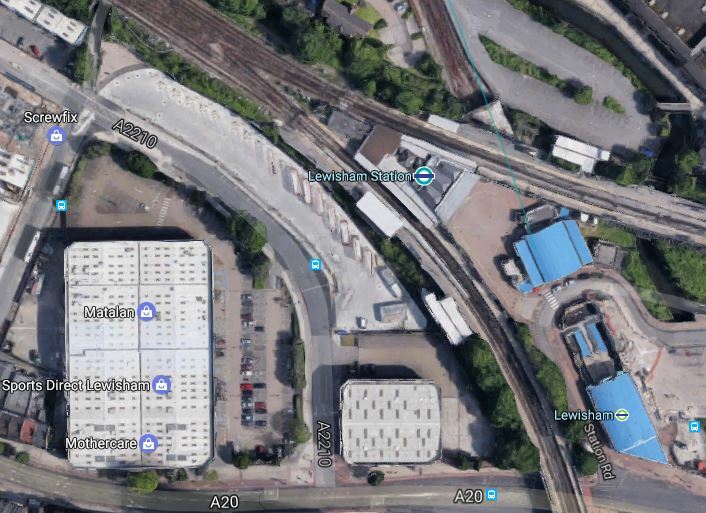 This Google Map shows the area, where Old Kent Road 1 station will be located. There are two options given for the location of the station. 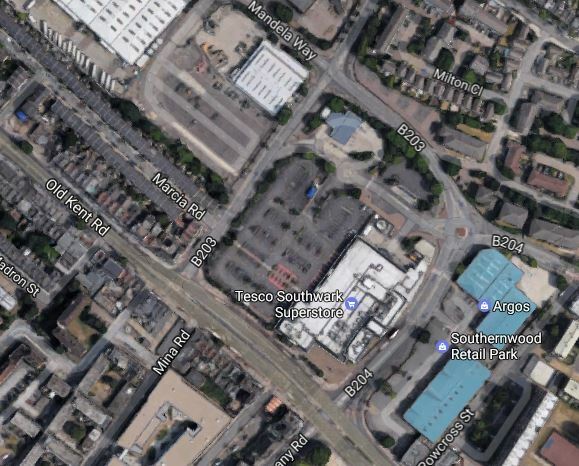 Note the Tesco Southwark Superstore in the middle of the map, with its car park alongside. Option A for the station is on the other side of Dunton Road and slightly to the North West of the car park. The other Option B is on the Old Kent Road on the site of the store itself. These pictures of the area around the Tesco store were taken on February 12th, 2017. The group of people most affected by the construction of the station will be those who shop at this Tesco. I suspect that given the company’s current position, Tesco would be happy to co-operate with TfL. After all there must be advasntages in having a superstore on top of an Underground station. If the Tesco Superstore had to be knocked down, there are lots more anonymous architectural gems like this one. So I wouldn’t be surprised to see Option B implemented, with a brand new station alongside the Old Kent Road. There are two options for this station. 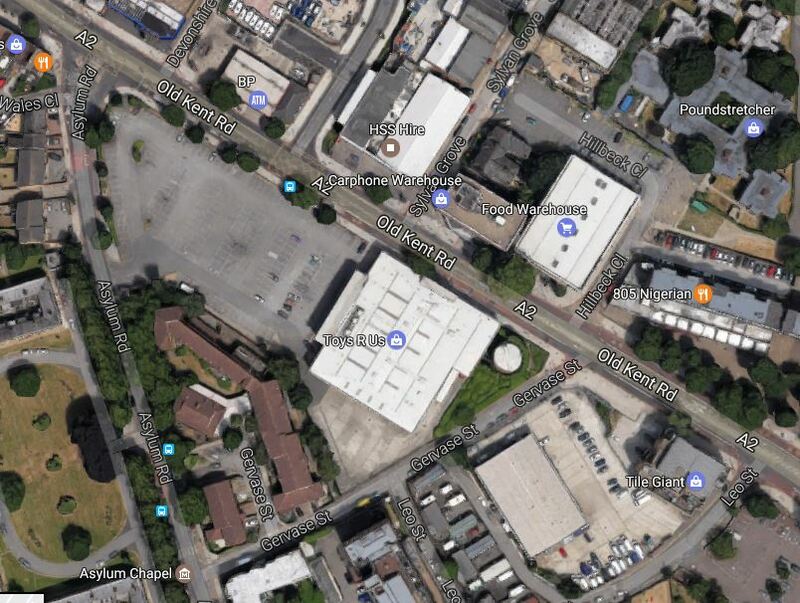 This Google Map shows the location of Option A opposite B & Q. The station will be on the the Currys PCWorld site along the road. These pictures of the area around the Currys PCWorld store were taken on February 12th, 2017. 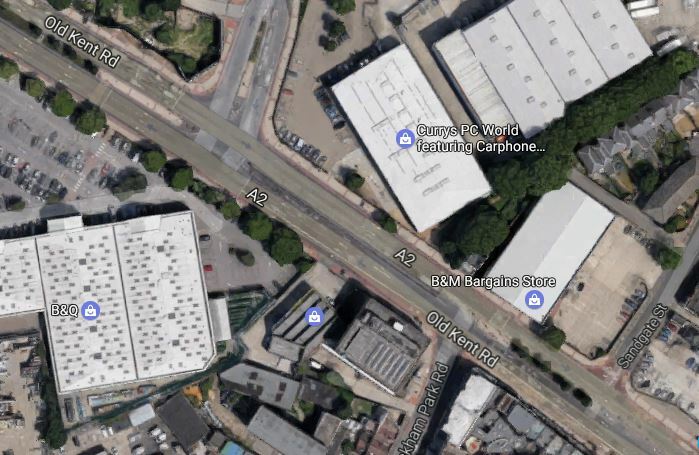 This Google Map shows the location of Option B on the Toys R Us site on the other side of the Old Kent Road. These pictures of the area around the Toys R Us store were taken on February 12th, 2017. Both chosen sites would appear to have plenty of space and wouldn’t require the demolishing of any housing. Note that the Toys R Us stored was closed in April 2018. Did Transport for London rewrite their plans and are they in negotiation for the now-vacant site? New Cross Gate station is an existing Overground and National Rail station. 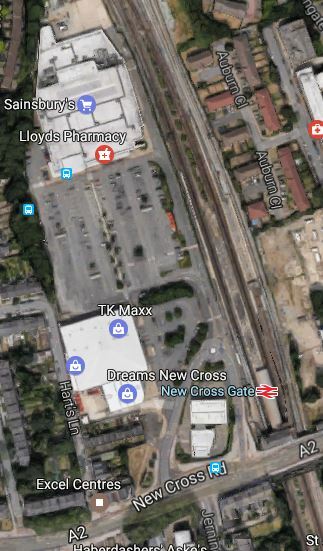 This Google Map shows the station and the Retail Park, that is alongside the station to the West. These pictures of the area around the Sainsburys store were taken on February 12th, 2017. The worksite would take over the car park, with the station being built underneath. This worksite is very much the most important site of the extension. The consultation says this. When the station is completed, I can envisage New Cross Gate becoming an important transport hub, with a quality shopping experience. 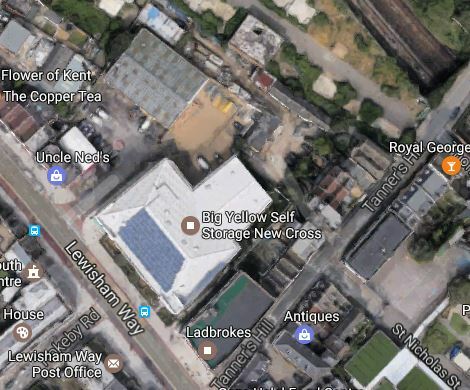 Alexandra Cottages, a short road off Lewisham Way has been proposed as the location of a shaft between New Cross Gate and Lewisham stations. This Google Map shows the location. I suppose the site has been chosen, as the site contains a Big Yellow Self Storage facility and a Ladbrokes betting shop. These pictures of the area around the storage facility were taken on February 13th, 2017. Will the shaft be buried in the basement of a development suitable for the area? 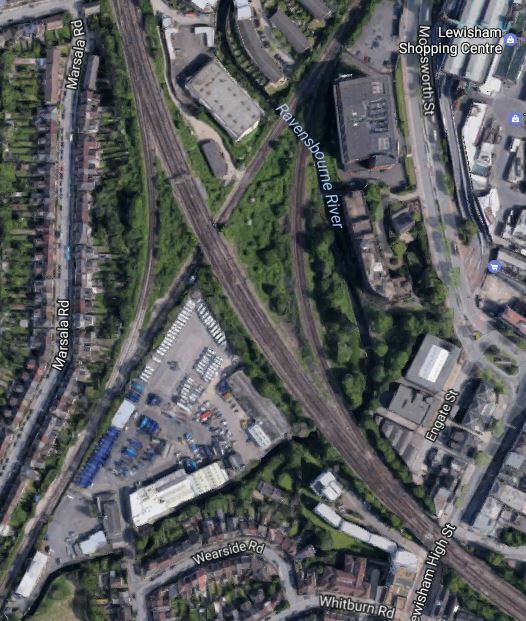 This Google Map shows the current Lewisham station. These pictures of the area around the Lewisham station were taken on February 13th, 2017. The new Bakerloo Line station will be underground between the station and Matalan. The area is currently bus parking. Because of the different levels and tunnels and some railway arches in good condition, the addition of the Bakerloo Line station could be a challenging one, but also one that could be architecturally worthwhile. Is the current station built on arches, that could allow passengers to circulate underneath? Could escalators and lifts connect the main line and ?Underground stations? Could there be significant oversite development on top of the station? Could the Bakerloo Line station be built without a blockade of the current station? Will Lewisham station be reorganised to be less of a bootleneck? It will be interesting to see the final design. This Google Map shows the worksite in Wearside Road, which will be used to create a shaft to the overrun tunnels. The multi-track line going North-West to South-East is the South Eastern Main Line, whilst the line going South-West to North-East is the Hayes Line. The worksite will go at the Northern end of the light-coloured area South of where the two lines cross. This map from carto.metro.free.fr shows the lines in the area. I think it is quite likely that the overrun tunnels will be under the Hayes Line. This document on the Lewisham Borough Council web site is a must-read document, as it gives the view of the Council and their consultants; Parsons Brinckerhoff about the Bakerloo Line Extension. The report is very much in favour of the Extension being built and it hopes that it can be extended using the Hayes Line, where the trains would terminate at either at Hayes or Beckenham Junction stations. Currently, Elephant and Castle station handles 14 tph, so as there would appear to be no terminal platform at that station, at least this number of trains will connect between the Bakerloo Line at Lewisham station and the Hayes Line.. But as other deep-level tube lines handle more trains, with the Victoria Line handling 36 tph by the end of this year, I don’t think it unreasonable to expect a service frequency in excess of 20 tph. The Wikipedia entry for the New Tube for London is quoting 27 tph. So could this give at least 10 tph to both Southern terminals? To handle 10 tph, I think it reasonable to assume that two terminal platforms are needed. 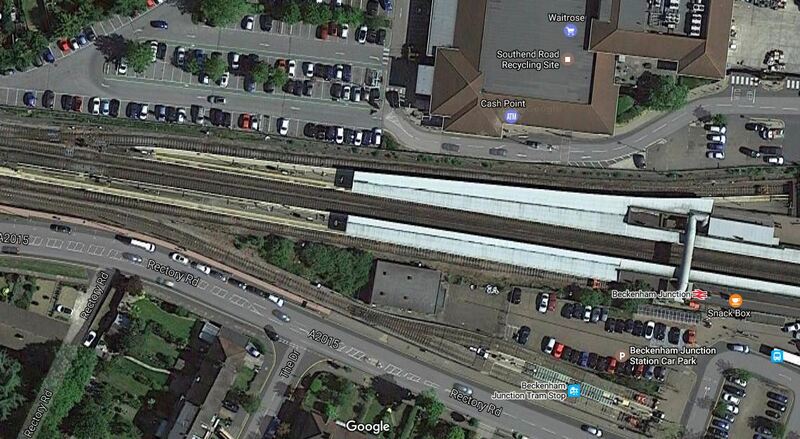 Hayes has two platforms, but Beckenham Junction has only one spare platform, as this Google Map shows. But I suspect if Waitrose are reasonable, a deal can be done. If the overrun tunnels at Lewisham station,are more-or-less under the Hayes Line, these tunnels would be easily connected to the Hayes Line in the following manner. , with all other services using the Courthill Loop to go on their way. Hayes station would swap its two tph services to both Cannon Street and Charing Cross stations for at least a 10 tph service on the Bakerloo Line. I also think, that services could go direct between Hayes and London Bridge, Cannon Street or Charing Cross using the Ladywell Loop. Beckenham Junction would have a similar service and I’m sure this would please Lewisham Borough Council. 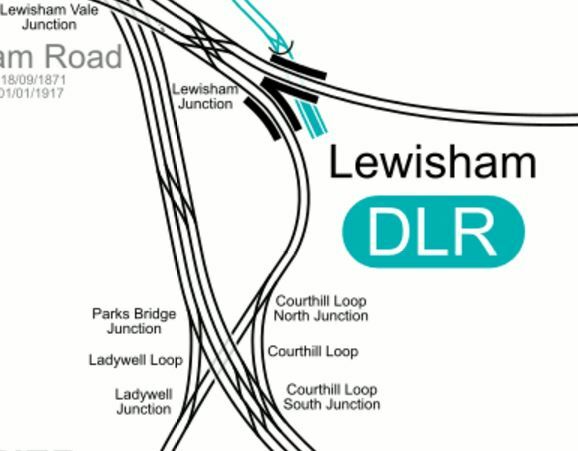 Network Rail would gain four paths per hour through Lewisham station to use for other services. Lewisham Borough Council also suggests the following for the Hayes Line. Move Lower Sydenham station further to the North. Create an interchange between Catford and Catford Bridge stations. Look seriously at the zones of stations on the Hayes Line. They are certainly forcible in what they want. This extension, looks like it is a railway designed to be built without too much fuss and objections. Most of the worksites seem to have good access and it would appear that few residential properties will be affected.